I am not a gardener, nor was I blessed with a green thumb. The first plant I called my own was a lucky bamboo tree from the flea market that I killed within a month. After researching succulents, I realized this was a great place to start with my gardening knowledge before venturing onto more difficult plants. 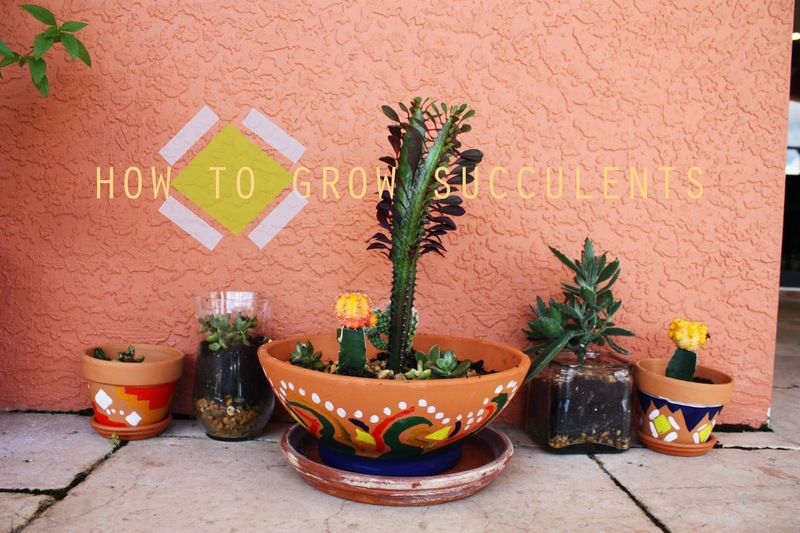 Succulents basically take care of themselves and have apparent signs when they need nourishment. All succulents follow similar rules. Bright indirect light is the most desired for these plants. Each species can tolerate different amounts of light so you will need to watch the leaves for indications of adequate light. If they receive too much sunlight the leaves turn brown or white at the edges as the plant bleaches out and soft tissues are destroyed. If they receive too little sunlight they will stretch with an elongated stem towards the light and the leaves become widely spaced out. Rotating the plants every couple of weeks will help with the amount of sunlight the entire plant receives. Your local Home Depot or Lowes sells cactus/ succulent soil mixes. The soil allows the water to penetrate easily and drain away rapidly. The soil cannot remain wet for long periods of time or it can possibly drown your succulents. In plant vessels that do not have proper drainage (jars, large bowls or vases) make sure to fill the bottom with rocks or pebbles to help the water drain into the bottom. Succulents love water. In the hotter months, make sure to water them once a week. In the colder months, you can switch it to every other week. Make sure to feel the soil before watering to make sure it is dry and then water the soil not the plant itself. Fill rocks/pebbles in the bottom of improper drainage vessels. Fill succulent soil half way in each pot. 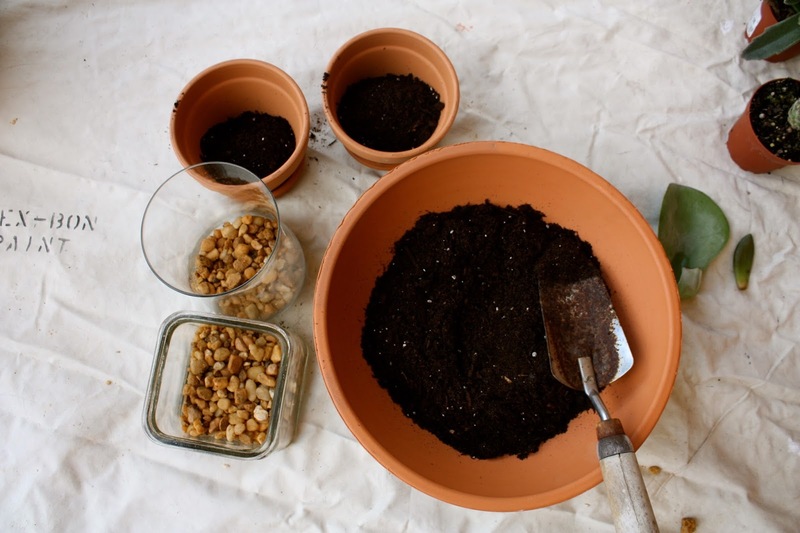 Remove plant from plastic container and place into your soiled pot. Add more soil around to safely hug your succulent. 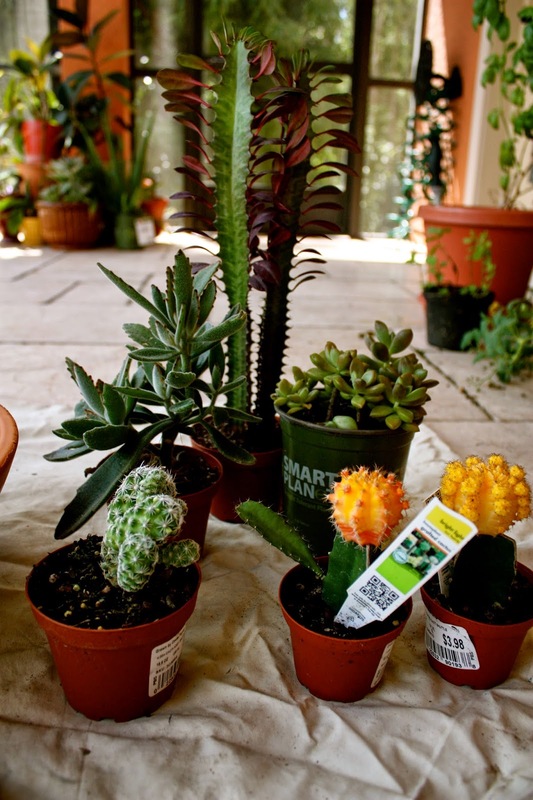 You may also plant clippings of other species of succulents into your soil. Add pebbles or rocks on top if preferred. Water and let them soak the sunshine.